I'm slowly getting better at the presentation of gifts rather than stopping at the thoughtfulness of gifts themselves. Although, I also sent off a package this afternoon for which I had to use unorthodox packing materials due to the nature of the contents and couldn't find my tissue paper or anything else cute to make it work. My apologies to that online friend! I'm anxious for all recipients involved to get their special deliveries if it means they'll be half as thrilled as I was to get my own package in the mail today! I've got a few things to share in that department this coming week so I'll save it for then. I hope your weekend has been extra special! rachel, these are super pretty! 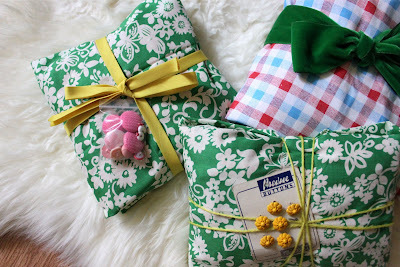 i love them - esp the fabric wrapping and the bright yellow buttons! lovely! Your presentation is unique, pretty, and definitely shows extra thoughtfulness. your packages are so pretty! tres pretty! It was a lovely weekend, wasn't it? those are *very* pretty packages! Adorable! I'm such a sucker for packaging and marketing, and need to make greater attention to this a goal of my own. Thanks for sharing. those are so darling rachel! i love the idea o including a bag of buttons. These look truly beautiful! 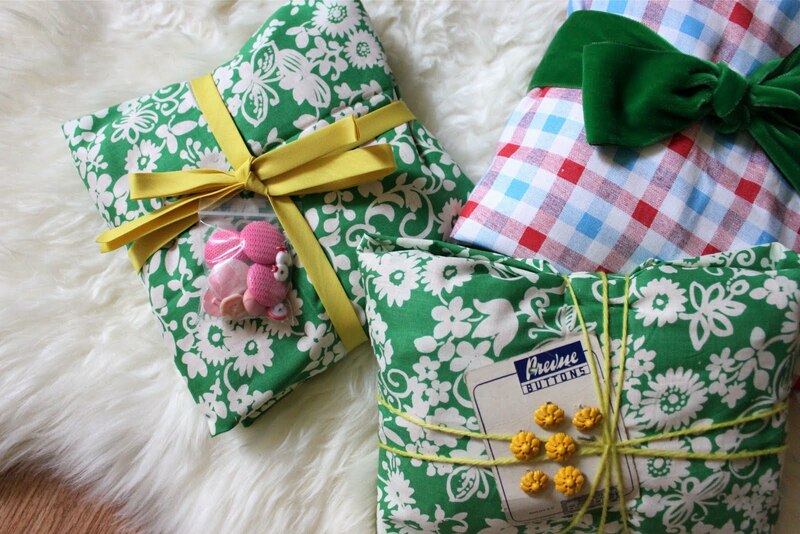 I wish every gift I received was wrapped in fabric instead of paper! That would make me SUPER happy!